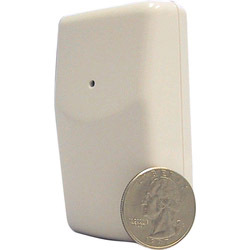 3 Zone Door/Window Wireless Transmitter that includes a mercury tilt switch for garage doors. Mercury tilt switch for garage door: Protects garage doors with its 'tilt' sensing capability. Reports 'Not Ready' and 'Secure' condition based on position of garage door. Easy installation...no magnet needed. Programmable tilt sensor output: Can instantly send a 'Not Ready' signal when the garage is opened OR can hold back the 'Not Ready' signal for 1 minute adding extra time to the entry delay. Low Battery LED indicator: Flashes every 5 seconds when a low battery condition is detected. Additionally it sends a signal to the 45A00-1 Wireless Receiver and HAI controller for battery low trouble notification. Built-in reed switch and 2 hardwire inputs: Use one sensor for 3 zones. Built in tamper switch: Alerts you when the cover is removed. This Door / Window Transmitter requires the use of an HAI 64 Zone Wireless Receiver (HAI Part Number 45A00-1).